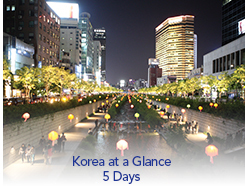 Dynamic yet steeped in tradition, Korea is the epitome of modern Asia. This itinerary offers an overview of Seoul, the fascinating capital city, Gyeongju, the ancient, beautifully preserved former capital and the bustling major sea port of Busan. Arrive in Seoul. Upon arrival, you are met by an English speaking assistant and transferred to the hotel. Founded as the capital of the Chosun Dynasty, Seoul is Korea's commercial, financial, and political hub. Early morning transfer to the train station- Car and driver only (No guide). Board your express train to Gyeongju, the spiritual and cultural capital of Korea. Gyeongju served as the capital of the Shilla Kingdom, which united the peninsula in 676 AD. Designated by UNESCO as one of the world's ten most historic sites, it is known as the "Museum Without Walls." Morning at leisure. Afternoon transfer to Busan Airport for a flight to Seoul- Car and driver only (No guide).